Seven Coves Bass Club members do not consider themselves just competitive bass anglers and conservationists. Our membership consists of many outreach participants that assist and organize events that help others in our community, and beyond. Through our annual Team Open “Fall Bass Classic” on Lake Conroe, we have raised over $15,000 for the Montgomery County Food Bank, Montgomery United Methodist Church Food Pantry, and Montgomery County Youth Services. 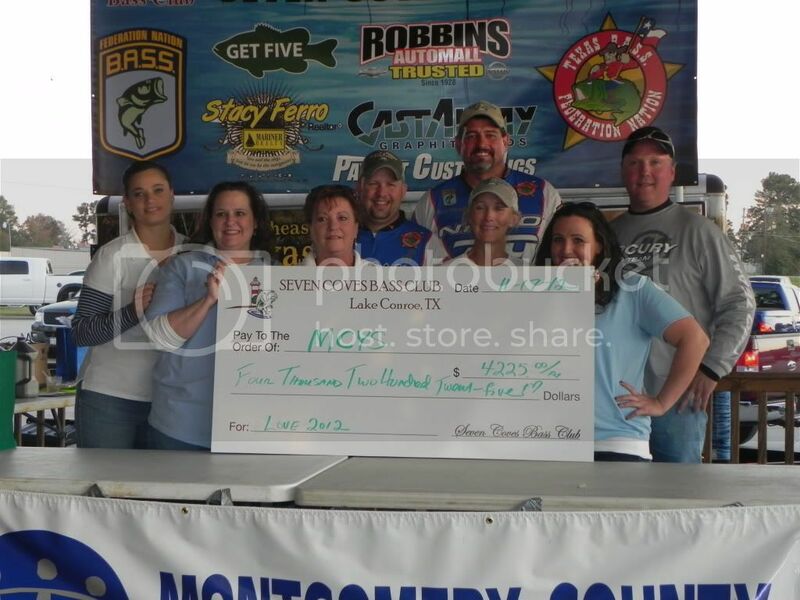 In 2012 we raised a record $4,225 for MCYS and hope to break that record at the 6th Annual SCBC Fall Bass Classic in 2013. SCBC proudly supports Props To Our Soldiers. SCBC Presented a Check for $1,752 to Keep Kids Connected. This is an awesome story of a young lady who not only overcame adversity by beating cancer, but wanted to turn around and help other children in similar situations. KKC purchases netbooks for children in need that are undergoing treatments in hospitals that cannot have direct physical contact with their friends, family, and teachers. It was really a special day for Conroe Fire Department Chief Will Wilkinson, who is battling brain cancer. Wilkinson was granted his wish May 31 to go bass fishing with some of his fellow firefighters. The trip was made possible by the efforts of Bill Hart, special friend of the chief’s, and Perry Powell, a professional angler who is on the advisory council for The United Special Sportsman’s Alliance, and the Seven Coves Bass Club. All left Stow Away Marina docks at around 7:30 that morning. 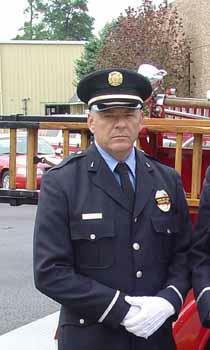 The chief and Powell were followed closely by six Seven Coves members’ boats accompanied by the chief’s fellow firefighters, who were keeping a very close eye on their friend and mentor. After about five hours the chief and his entourage headed back to the docks where the bass club members had prepared a cookout and all enjoyed the food and fun for another hour or so before the day ended. Over a dozen swimmers will hit the water in Lake Conroe Saturday morning for the Montgomery County Food Bank. The swim started last year by Montgomery High School swim team member Lauren Knutson. Last year $7500 was raised for the Montgomery County Food Bank which would enable them to purchase 75,000 pounds of food. 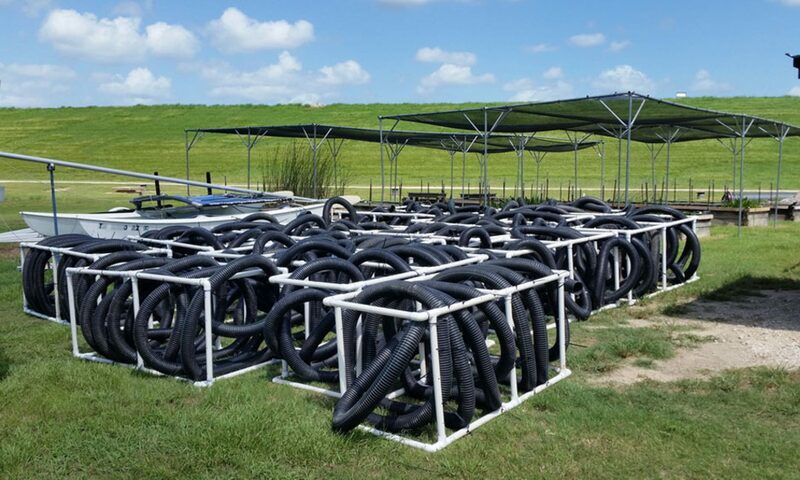 The swim team will be starting at the northeast side of the FM1097 bridge at 8:30am and swim approximately 1.6 miles across the San Jacinto River channel which at times has strong currents. The swim will take approximately one hour to one and one half hours to complete. The Seven Coves Bass Club will be surrounding the swimmers with boats and there will be four lifeguards on those boats. They will end the swim at Playa Vista condos, which has graciously donated the use of their pool and clubhouse for a party following the swim. Donations can be mailed to “Fighting the Tide against Hunger”, care of Montgomery United Methodist Church, PO Box 1330, Montgomery, 77356. Checks should be written to the Montgomery County Food Bank. They are encouraging cash or check donations, since the food bank can purchase 10 pounds of food for every dollar donated. SCBC was contacted for a request in helping a young 18 year old man named Ricky from Michigan. 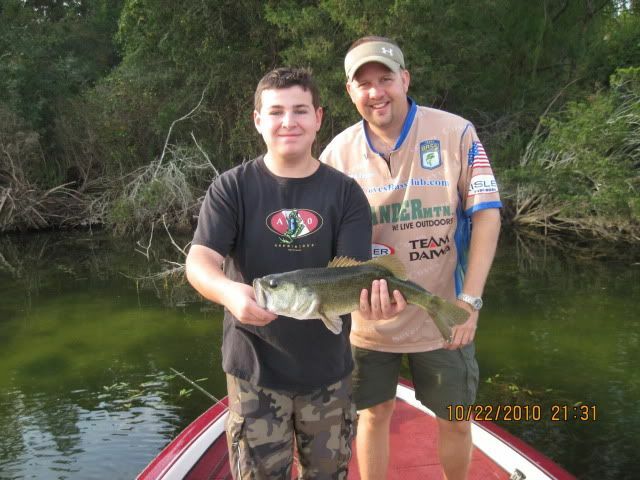 Ricky was undergoing treatments and tests for cancer and made a request to fish Lake Conroe. 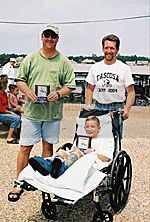 On April 9, 2009, Perry Powell, a professional angler who is on the advisory council for The United Special Sportsman’s Alliance took Ricky out fishing. SCBC members aided Perry in making a dream come true for Ricky; catching bass on Lake Conroe! Since 2009, Seven Coves Bass Club, led by member Matt Russell, has raised over $4,000 for the Montgomery County Food Bank. Every dollar raised allows the Food Pantry to purchase over 20,000 pounds of food for Montgomery County citizens in need. 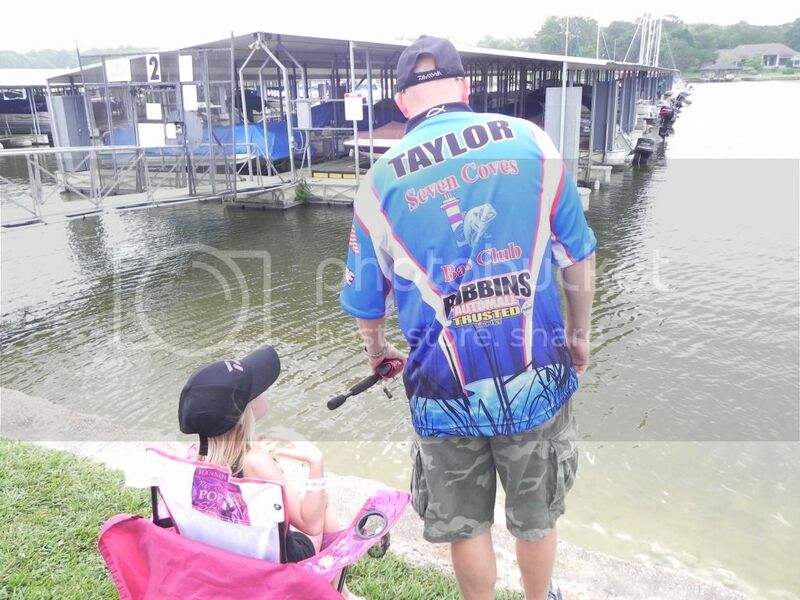 SCBC Members Participate in the annual Kids Unlimted Tournament on Fayette County Lake.